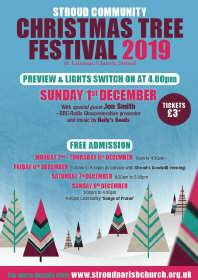 Preview and lights switch-on at 4:00 p.m.
Kate Clark, BBC Radio Gloucestershire Presenter. 4:00 pm Community Songs of Praise. Everyone welcome! "It's a Wonderful Life" performed by the Cotswold Players amongst the Christmas Trees!